Value for money dual-sided SPD pedal, a favourite XC mountain bike SPD. Weight: 380 grams per pair. In any category you could test the PD-M520 Shimano SPD in, it would struggle to better 75%. But it's this level of consistency that has made it the most popular clipless pedals for UK mountain bikers (WMB's highly unscientific research based upon riders we see out and about during our daily grind around the trails). 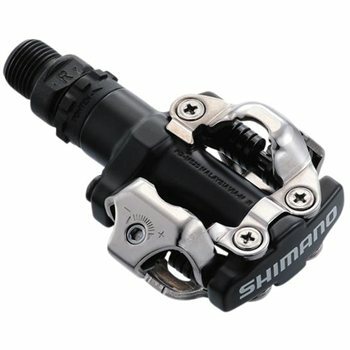 The pedal wins because it uses the exact same mechanism to control entry and release as its more expensive Shimano brethren, with only materials down specced to meet the price. Talking of price, the M520 costs little enough (prices online are as little as £20) so should complete failure occur, and it's practically unheard of, you could bin then and buy more without too many tears being lost. On the trail a new, well-lubed M520 is very hard to tell apart from the XT and XTR. The tunable release tension is the same, and while it can be a bit stickier when new, we've run them for years without ever feeling that were hampering either our performance or the ride. Service is certainly required yearly, on par with most other pedals at this price, and is something that takes the average rider about half an hour to do the pair. "These pedals offer amazing value to access genuine Shimano SPD performance"